Singapore – Aug 13, 2018: Bomanbridge Media, a Singapore-based content distribution and production agency recently announced the sale of award winning director, Yann Arthus-Bertrand’s ‘From Above’ series in Asia. These blue-chip documentaries, represented by Calt Distribution and produced by Bertrand’s indie ‘HOPE Productions’, have been acquired by key public broadcasters in Asia Pac, including CCTV 9 China, PTS Taiwan, TVB Hong Kong, VTV Vietnam, True Visions and TPBS Thailand, RTB Brunei and SBS Australia. 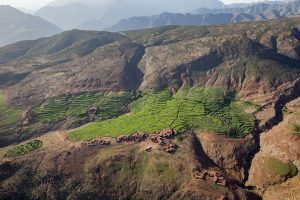 These programs, Morocco From Above (produced in 4K), Algeria From Above, Mediterranean: A Sea For All, and Bangladesh: Climate Change feature Bertrand’s particular style. With substantial production budgets, Bertrand skilfully crafted and captured beautiful geometrical landscapes through complex aerial shots. “Bomanbridge is extremely pleased to have sold these shows across Asia Pac as they are both beautiful and environmentally relevant. These shows portray to audiences the stunning images of a beautiful earth as well as threatened landscapes, but also importantly reminds us of how the ecological balance is not being respected. Broadcasters need this calibre of programming, both eloquent and impactful, to demonstrate the important of environmental sensitivity,” said Sonia Fleck, CEO of Bomanbridge Media.